The time may have come for Warren County to retire from the railroad business, says Ron Conover, the chairman of the Board of Supervisors. In his annual message to the board, Conover broached the possibility of replacing the rail line between Stony Creek and North River, which the County owns and currently leases to Iowa-Pacific’s tourist train, with a multi-use recreational trail. “I think the prudent thing at this stage is to begin to investigate whether a recreational trail should be created, by whom, at what cost, for which users; we should also ask how to pay for its creation and maintenance,” Conover said in his message, delivered at the municipal center on January 4. Conover began his remarks by alluding to the controversy over Iowa-Pacific’s transportation of empty rail cars through Warren County to a storage site on tracks within the Adirondack Forest Preserve. “Continuing and growing concerns regarding railroad storage facilities in the Adirondacks adds to our sentiments that the railroad corridor could provide a larger economic benefit and further underscores the need for a plan of action,” Conover stated. Speaking with reporters afterward, Conover said he hoped to see a recreational corridor plan completed before the County’s five year leasing agreement with Iowa Pacific expires within the next few years. “As with any good business plan, you evaluate the alternatives. It’s time to begin the conversation about alternatives to leasing the rail line to an outside operator,” said Conover. Conover noted that Governor Andrew Cuomo, Comptroller Tom DiNapoli, Attorney General Eric Schneiderman and DEC Commissioner Basil Seggos, in addition to Warren and Essex Counties, are all adamantly opposed to the storage of railroad cars within the Forest Preserve. Earlier this month, two environmental groups, Adirondack Wild: Friends of the Forest Preserve and the nonprofit law firm Earthjustice, issued a call to the Adirondack Park Agency to assert its authority under the state’s Wild, Scenic and Recreational Rivers System Act to end the storage of discarded cars. But even if Iowa Pacific’s plan to warehouse cars is legal, it still is cause for concern, said Conover. “We didn’t go into partnership with Iowa Pacific Holdings to become a graveyard for old railroad cars. We partnered to operate train service. Although they warehouse cars in Hamilton and Essex Counties, which the company owns outright, they use our tracks to transport them there. And if the company pulls out of New York State, we may responsible for removing any cars they leave there,” said Conover. Conover is likely to find support for any proposal to replace the railroad line with a recreational trail among the region’s environmental protection groups. “This corridor could be a great asset for the Park and communities that host access points to the popular Forest Preserve and state waters. The corridor might host a multiuse recreational trail, or something else,” said Janeway. Peter Bauer, the executive director of Protect the Adirondacks, believes a multi-use Sanford Lake rail line corridor should be connected to one traversing Warren and Saratoga Counties. “This would be a true community-to-community trail from Saratoga Springs to Newcomb, a European style countryside walking trail, a bike trail, a totally accessible trail, a cross country ski and snowmobile trail, and it already has both a wide defined corridor and connects hamlet areas. The dividends for the region and for communities along the rail line would be far greater with a community-to-community pedestrian trail than with a dying railroad whose only viable revenue stream comes from trashing the Adirondacks,” said Bauer. Photos from above: The North Creek Station when D&H still operated the railroad; Opening of the Saratoga-North Creek Railroad, 2012; and Cars in “the linear junkyard” courtesy Adirondack Council. A version of this article first appeared on the Lake George Mirror. Wait for it, wait for it; the rail crowd should be checking in real soon with all the reasons why a trail is no good! Not at all. Here is the chance to beat out the West central Adirondacks and Remsen Lake Placid Corridor by Having the first significant Adirondack Rail Trail. Good luck. I think the politician have spent enough tax money on the rail line. Two useless stations built for millions at Hadley and Thurman. Hired part time summer help to sit and read a book, why, because no one takes the train to no where. Moved the ice cream caboose that was never operational. Let’s face it Warren county politicians love to waste tax dollars, just look how occupancy tax dollars are not accounted for. If they bothered to do any research at all they would know that “tourist trains” don’t make any money. Time to let the citizens decide what should happen to the railroad track. Continuation of the Warren county bike trail, which was proposed years ago, would work in my mind. Just a few RR’s in the Adirondacks. Thousands of miles of trails. Is the best thing to turn the few into the many? Maybe? We could turn that line into a living museum showing the decay of the line from TR’s midnight ride to become a new president to an example of what has happened to the viability of backcountry rail in the Adirondack Park since his ride. Go for it! I guarantee those losers, Iowa-Pacific, will stick you with removing the cars. The lack of passengers points again to the fact rail travel to the ADK is not going to happen. Just look at how few people get off at the 4 stops on the train to and from Montreal: very few. The railroad has violated its contract with the county; the county should begin the process of removing Iowa-Pacific immediately, while studying the right-of-way’s future. Recent flooding damage along the Hudson further compromises the railroad. Will they abandon the contract if damage is expensive to repair? 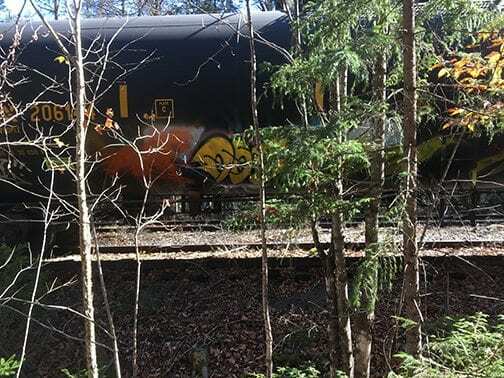 Will the damage complicate removal of those #$%%^& tank cars? 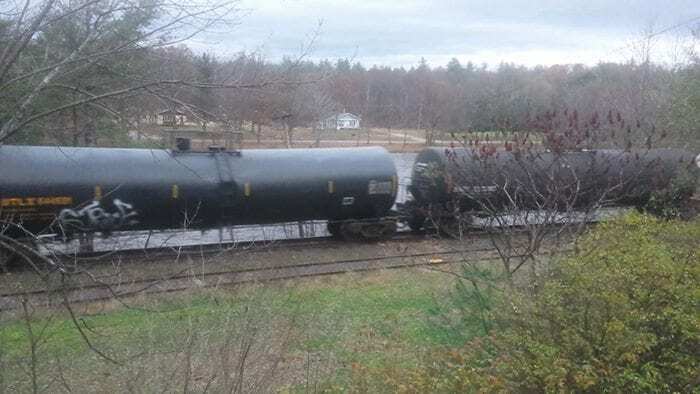 How does empty, clean tank cars, that do not block anyone’s view be worse than gasoline polluting machines that tear up the scenery, and human trash left behind? 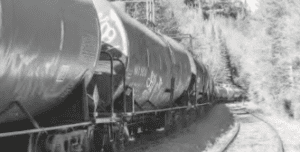 empty, clean tank cars provide NO ECONOMIC dollars to the area, snowmobiles, hikers, bikers, cross-county skiers all PROVIDE ECONOMIC DOLLARS to the local economies. I guess improving the local area is foreign to you! Absolutely Ben and they leave less of a foot print ( not that they could leave any on a rail bed) than most hiking trails in the wilderness. We police at least 10 miles of the Adirondack Rail that is C7 in the winter and you could not fill a lunch bag with debris. First, they may be ’empty’, but there is no such thing as a clean rail car. Second, they may not ‘block views’, but parked without gaps they do block larger animals from passing and will likely attract vandals and miscreants. Third, I am no fan of snowmobiles, but how do they “tear up the scenery”? A multi use recreation trail is NOT a hiking trail. The people who keep pushing this description are disingenuous. A recreation trail is used by multiple types of recreation from walking, running, bicycling to snowmobiling, snowshoeing and other popular recreation endeavors. It has become quite obvious that there are very few people interested in riding a train to North Creek. Thus the storage of tank cars. keeping train tracks because there aren’t others in the area is a waste of resources. Time to try the trail. Who knows it may boost more year around residents interested in this type of amenity along with Skiing at Gore and rafting the Hudson. Can’t even get one rail trail out of the courts. Good luck with another. Why not just (or also while you are waiting) build a “multi-use” trail on some of these other trails we already have? Then everyone can see if it is as wildly popular as speculated and then getting the rail trail will be a piece of cake? More than one – look familiar? Never mind what a community wants. This would be a wonderful addition to the park. Everything requires maintenance, but as a railroad you need everything to be complete to operate, you need engineering, contractors and rail specific equipment to do anything where anyone can work on a trail as exemplified by the Thendara to Lake Placid line where the Snowmobilers did bridges, tree clearing and grooming with NO State money for 40+ years. In the Off snow months, the clubs would be glad to do maintenance to keep the trail up. And if the Railroad makes money is immaterial unless it has a substantial economic impact on the area as snowmobiling has. And again, you talk about 1 business monopolizing the tracks. If you remove the tracks MANY MORE different types of activities can also be on the trail. There are many different types of tandem pedal bikes that could use the trail also in place of the rail bikes. We’re talking wilderness and the Adirondacks Bill (not the Carolina’s) which should be about preservation and serenity and magic…. not a playground for noisy machines and thrill-seekers which we have everywhere else. Is nothing sacred anymore?! I see it now! Another generation or two there’ll be nobody left to defend wilderness. Convenience’s and contraptions alike will get us there. Sorry but the railroad can make money if done correctly. Tourist lines can make money. Look at the Durango and Silverton! We should not lose the rail. The county should not be so blind to the fact money can be made if managed properly. It’s not right for county to tell what cars a railroad can or can not move. This line is being maitained the best it has been in years and Iowa Pacific has a lot invested. People are employed and it take time to build traffic. This storage is a temporary way to generate income. Hell it’s no different than when the D&H stored hundred of ore hoppers in the Adirondacks and up at the mine! This is just a different type of car on the same old tracks. Lets stop hugging trees and trail lovers and start finding a way to support the railroad and generate more traffic. This is nothing but a cheap trick to stop rail car movements. I hope to God IP sues the hell out of warren county and NYS! I was never a fan of the railroad venture, but I have to admit that Iowa Pacific did a fantastic job trying to make their tourist operations work. They received every bit of support Warren County could possibly provide, including looking the other way as SNCR failed to meet contractual requirements. The railroad venture has had 20 years to demonstrate success, 7 under IP. In fact, nothing has changed since D&H ended passenger service in the 1950s and the last train from the mine in 1989. Sorry, the words “correctly” and “properly” are hollow in this context. The best and cheapest thing to do is SELL the PROPERTY, The Right OF WAY RAILS AND ALL to IOWA PACIFIC Rail Road to use as a tourist train or they wish, and the HELL with all the ENVIRONMENTAL DESPOTS!!!! The “environmental despots” had nothing to do with IP’s failure to profitably operate the tourist train or remove tailings, which was their purpose they sold the counties on. Why would IP buy it – even if they could?? I see no reason why they would want it. There is no lipstick to make this pig attractive unless the mine starts up again. In the seven stages of grief over the demise of local railroad branches – which began in the 1930s and was largely complete by the 1950s – you are apparently stuck at the third, “anger”. Your support group is not helping you, other angry railfans. It’s 2018 – time to break free and move on. Get a bicycle! Seriously, rolling noiselessly down a bucolic bike path on a warm sunny day along a babbling brook is very soothing. Like racing 60MPH down a groomed snowmobile trail with an ear splitting buzz cutting across the Whitney Wilderness is? Look if you support a rail trail you should describe all of it’s uses not just the quiet ones. Many who support a ASR rail trail support it because they want to do what I describe and do it for a longer season than they can with rails. Replace McKenzie Mt Wilderness if they only get the LP to TL section. While you are probably correct, just because a multi-use trail is a possibility, doesn’t mean snowmobile use has to be allowed on any or all of it. For instance, perhaps a portion of the northern section beyond Newcomb could be left as motor-free. But we are a long way from any trail at the moment and may be getting ahead of ourselves. No different than a diesel smelling, bell clanging, horn blowing, train stopping and disgorging its payload on the shores of Lake Lila, located in a Wilderness area during paddling season. Snowmobiles in the winter on a trail when hardly anyone else is out there? Nah, no comparison. I’ll take the snowmobile any time. Sorry Iowa Pacific will never make this line work. They had a great idea many years ago to get the tilings out of the old Tahawus mine, but it never came to pass. They tried to run a scenic railroad from Saratoga to North Creek & it cost them a million dollars a year in LOSSES! Warren county gave them all the help/tax breaks they could & Iowa Pacific NEVER lived up to their end of the contract. Time to cut the county’s loss, but them out, force them to remove all the stored cars as part of that buy-out; tear the tracks up & make a multi-use trail. Hasn’t the entire history of this particular rail line been an economical disaster? Such a trail would be awesome.